Pets have never been a bigger part of the family. So it only makes sense to include yours on the family vacation, right? Before you go, we’ve compiled some tips to help keep your pet safe and comfortable. Your pet should be healthy enough for travel and current on his or her vaccinations. Share your vacation destination with your veterinarian so they can determine how to protect your pet from potential risks in that region. 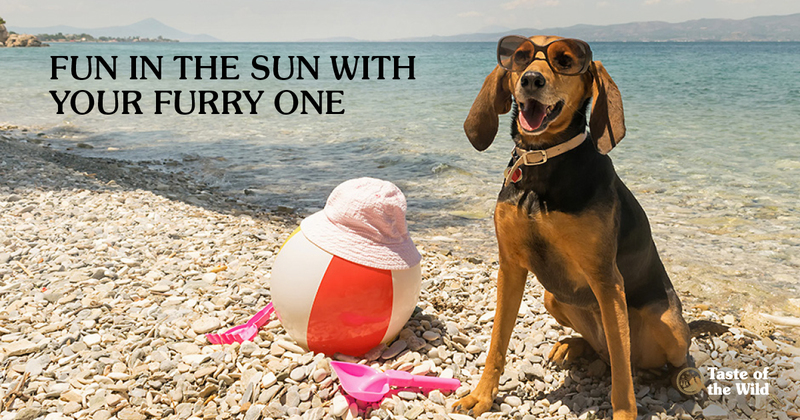 When you’re escaping the snowdrifts for the beaches, it’s easy to forget about flea, tick and heartworm preventives, so make sure you bring the right parasite protection. No matter how careful you are, pets can escape and get lost in unfamiliar locations. That’s why your pet should have an updated ID tag on his or her collar, including the address of your destination and your cell phone number. If your pet dashes out without his or her collar, a microchip provides a backup. Veterinary clinics, shelters and animal control centers can scan your pet and find out how to reach you. Before departure, make sure your microchip company has your current contact information, including where you can be reached during vacation. There are even GPS devices with apps that enable you to track your pet’s location from your smartphone. Whether you’ll travel by plane, train or car, it’s best to have your pet in a well-ventilated carrier. The carrier should be roomy enough to allow your pet to stand, turn around and lay down. Always provide fresh water and a litter pan for cats. If your pet isn’t accustomed to being in a carrier, introduce it to them at home, several weeks before your departure. Pad the bottom with their favorite blanket and place treats or toys inside so they associate positive things with it. Leave the door open so they can explore inside, then try closing the door for short periods, gradually extending the time the door is closed. For flights within the United States, you’ll need a health certificate from your veterinarian within 10 days of departure that verifies your pet is healthy and current on vaccinations. International travel means additional paperwork and some countries require a quarantine period, so it’s important to determine what’s required well before you leave. Although small pets may accompany you in the cabin in an approved carrier, larger pets generally travel in the cargo bay. During warmer months, try to schedule flights in the morning or evening when the temperatures are cooler. In winter, book flights in the middle of the day. Because tranquilizers can slow your pet’s breathing, they’re typically not recommended. Inside the car, pets should be in a carrier so they don’t distract the driver or become airborne in the event of an accident. The carrier should be anchored down so it doesn’t shift with the movement of the car. Although dogs may ride in a seat if they wear a harness that fastens to a seat belt, avoid the passenger seat, because pets can be seriously injured if the airbag deploys. Regardless of how cute it may be, never let your dog ride with his or her head out the window while the car is moving. And never leave your pet in the car unattended. If your pet isn’t used to riding in a car, make a few trial runs in the weeks before your trip. Place your pet in the carrier, drive around the block and then reward your pet with praise or treats. Gradually extend the length of the drive, ending somewhere fun, like a dog park. Before you go, find pet-friendly hotels along the way. Some may have limitations in terms of pet breeds and sizes, while others may offer special services like dog walking while you’re out for dinner. It’s best to know before you go. While it may be fun to have your pet accompany you on vacation, travel can be stressful, especially for cats and elderly pets. If your pet’s health or temperament could make travel a challenge, consider a pet staycation. Many boarding facilities offer group playtime, swimming and other activities. And if your pet can’t stay with a friend or relative, it’s possible to hire a pet sitter to care for your pet in the comfort of your home. With the right planning, a little R&R can do you both some good.